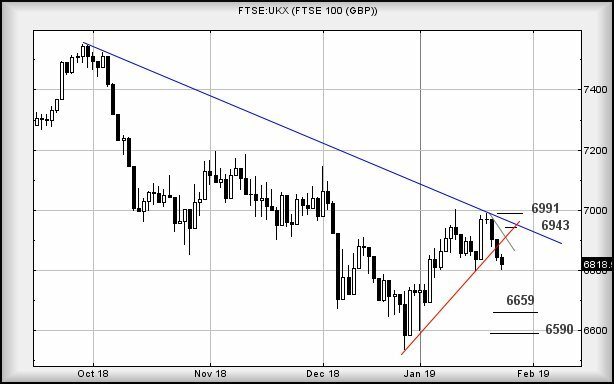 FTSE for FRIDAY #Nasdaq #Gold #Patisserie Valerie’s demise came as a surprise, even to us. We’re quite used to companies issuing unexpected news but equally aware their share price movements generally warn of such in the weeks/months before. With Patisserie Val (LSE:CAKE), there was absolutely nothing. In fact, the converse was true as a fairly strong argument existed for a price rise. We can only speculate on the causes of its death, given the news rather a lot of shares were sold prior to CAKE being crushed. Investors can be confident the regulators will doubtless fully investigate and, as usual, do nothing! The market closed Thursday at 6818 points, threatening weakness continuing below 6800 shall bring reversal to 6659 points next! Our secondary, if 6659 breaks, is at 6590 points. The tightest stop position is quite wide, presenting itself at 6909 points. The pace of decline during the last few sessions has been fairly relentless, if gentle. Unfortunately, given the point the market closed on Thursday, there is little reason not to anticipate some further weakness. Only if now above 6909 dare we take any recovery seriously as this permits an initial 6943 with secondary, if bettered, calculating at a visually unlikely 6991 points.